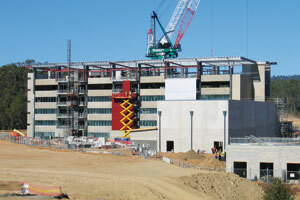 National Precast looks at how precast concrete fabrication can provide time, productivity and safety benefits for the Australian civil construction sector. Like all industries today, the construction space endeavours to improve business efficiencies. However, it faces unique challenges that arise from complex projects and these complexities can create significant risks and inefficiencies. Construction risk begins at a project’s early conceptual stage and ends as the last finishing trade leaves the site. Risks include time extensions from inadequate programming, delays in material delivery, labour disruptions, safety issues and inclement weather. Risk is heightened where project documentation is incomplete, material quality is poor, safety is lacking, or workmanship is tardy. If not properly managed, these construction risks can significantly increase a project’s costs. According to National Precast’s Chief Executive Officer, Sarah Bachmann, precast concrete addresses many of these risks and minimises potential cost increases. “Manufactured off-site in dedicated factories, precast concrete offers arguably the biggest opportunity to improve efficiencies and minimise risk in construction today,” Ms. Bachmann says. Manufacturing precast components can begin as soon as shop drawings are approved. Once precast erection commences, on-site construction and off-site manufacture can be overlapped, reducing overall construction times. “The increased size and availability of mobile cranes has encouraged larger and heavier elements to be produced, which are now easily lifted directly into position on the site,” Ms. Bachmann explains. There are additional time-saving benefits when a structure adopts a total precast solution (using walls, floors, beams, columns, stairs, and lift shafts). For example, when precast flooring is used, there is minimal formwork and therefore subsequent trades can continue immediately. 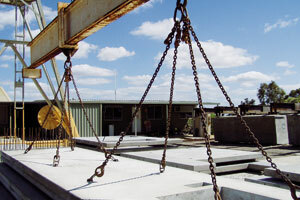 As well, using total precast maximises use of the crane. Additionally, Ms. Bachmann says the skill levels in precast factories are another advantage and the high quality of products delivered to site also helps to speed construction and reduce construction risk. “Precast factories assess and train their workforces, with many employees completing competency assessments for the licenced tasks undertaken in their factory,” Ms. Bachmann adds. Just as using precast will shorten programs – which in itself reduces cost and minimises risk – there are other cost efficiencies that can work to counteract a project’s cost blowouts. A solid understanding of the precast process from the start, alongside meticulous planning, working with the precaster and reduced time on site will reap rewards. During design and manufacture, economies of scale can be achieved by maximising repetition of precast elements. “Obviously, the more repetition there is in terms of consistent shapes and sizes, the less need to adjust moulds in the factory before each pour,” Ms. Bachmann says. Ms. Bachmann says the construction industry is currently ranked third in the list of annual workplace deaths. As a result, safety costs on site can be significant and anything that can improve site safety is critical. “Taking works away from the construction site and moving them into a controlled factory environment is simply a no-brainer when it comes to safety,” she claims. While proper construction drawings and document management may not spring to mind as the number one cause of a project’s cost and time blowouts, they can be the silent killer for a range of issues. As such, producing fully detailed working drawings before commencing precast manufacture is essential. While going to tender with partially completed documentation can be beneficial for assessing current building cost and construction techniques, the necessary detailed design development is often overlooked. Poor working drawings can lead to increased construction risk and cost. With good working drawings, the subsequent shop drawing process which precedes precast manufacture can eliminate many of the time and cost frustrations right from the start. Concrete pipes: Are they manufactured and tested to AS/NZS 4058?